Plans for Jane* and Peter’s* dream house were years in the making. Their stunning, Old World style home -- combining elegant European elements with casual, waterfront living — began taking shape with pages taken from design magazines. Those plans began coming together when Jane and Peter, owners of a small business in Jacksonville, bought a prime lot on the tip of a peninsula in Queen’s Harbor. 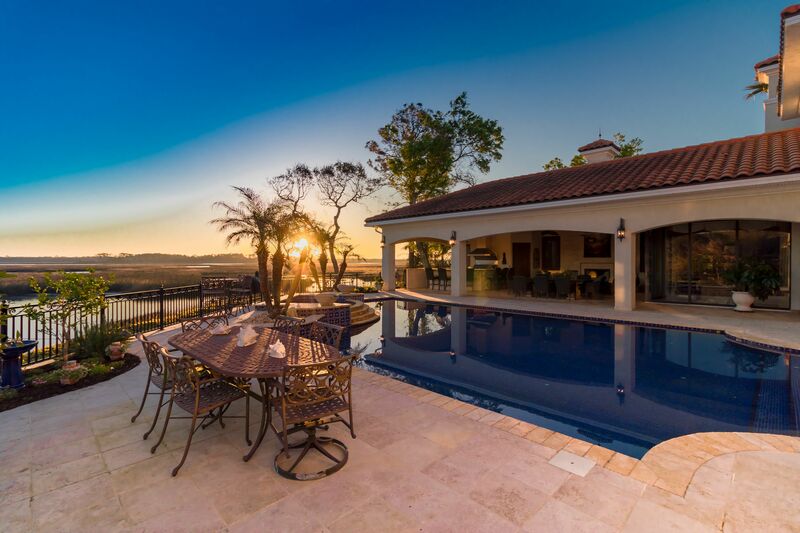 Its location offered privacy, dazzling views of pristine marsh areas and the Intracoastal, and easy access for boating. Jane and Peter hired prominent Jacksonville architect Kevin Gray to nail down their vision for a classic, one-of-a-kind family home for themselves and their two sons. The couple had a few must-haves: Two-story living and dining rooms that joined as one grand room stretching to the back of the house for water views. A two-story wall of windows for panoramic water views. And stone floors everywhere except in the bedrooms. The couple ended up with a two-story, 7,300 square foot home flooded with natural light and astonishing water views, and filled with luxury features, superior materials, and exquisite handiwork. Floors are stone and columns are authentic marble. 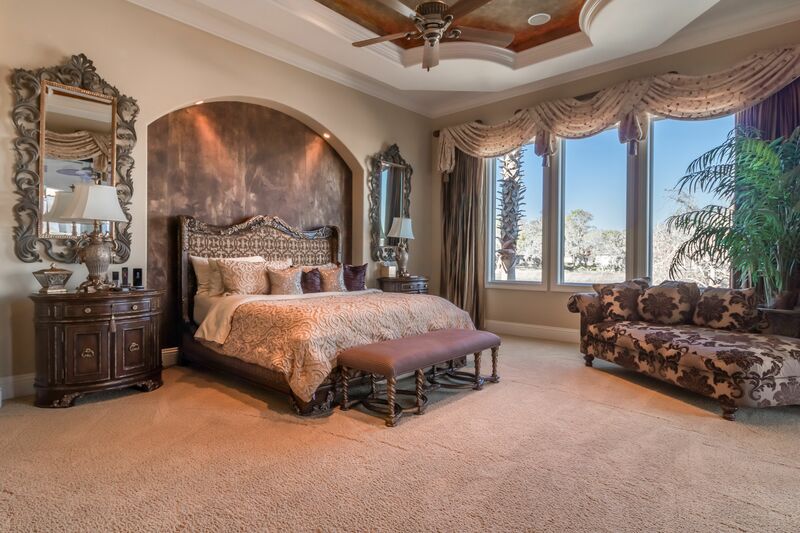 Many walls are venetian-style plaster finished with faux painting, and there are $250,000 of custom wood built-ins. The arched front door is custom wrought iron from Mexico and the foyer is an extraordinary mix of Italian stone, mosaic tile, and detailed ironwork; a large wine cellar is tucked beneath the staircase. The kitchen is chef quality, all bedrooms have en suites, and even the two garages have tiling and fine wood cabinetry. This is a home of superlatives. 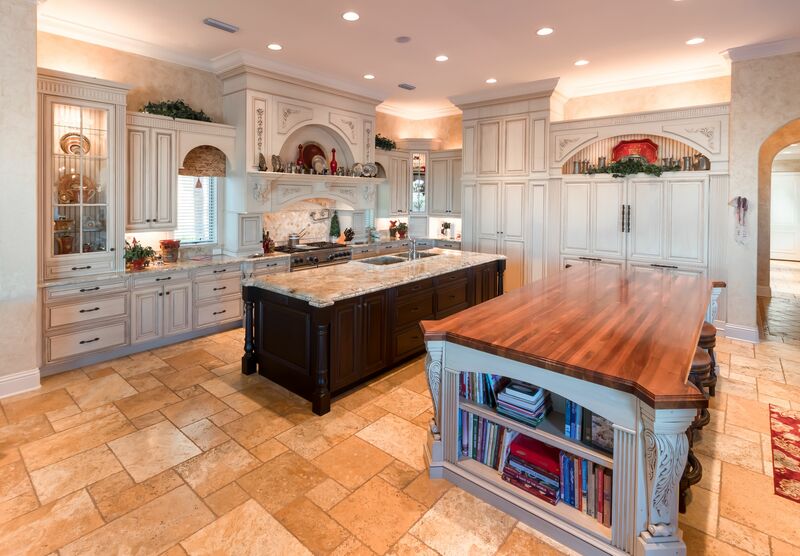 The couple enlisted the help of Neptune Beach’s Belmarmi, Inc., which specializes in exotic stone and European tradition design, to furnish the marble, stone, and tiles that reflect their European roots. That look begins in the foyer, where each step of the graceful, curved staircase is crafted from a solid custom stone slab highlighted with stone mosaic risers. The delicately detailed wrought iron stair railings were custom designed from magazine photos that Jane had collected and then forged by local ironworks craftsmen. Each of the home’s four fireplaces -- three are wood burning, the fourth is gas — is unique. For example, the ornate, marble living room fireplace that was hand crafted in Mexico, then reassembled and installed by craftsmen sent by the Mexican company, was designed to be tall enough to make a bold statement within the high-ceiling room. In Old World tradition, many of the walls are Venetian-style plaster finished with faux paint, perhaps best reflected in the lavishly appointed master bedroom suite. Behind the bed is a large, arched niche that appears to be bronze, but is actually covered with wallpaper that a faux painter designed and painted to resemble bronze. The bedroom’s tray ceiling, which features hidden, recessed low lighting, is faux painted to match the niche. Another nod to European styling is a second level walkway overlooking the living/dining great room that features columns, arches and iron railings. The walkway connects a water-view sitting area and a guest room on one side of the house with more bedrooms and a media/game room on the other. The couple also added overlooks and Juliette balconies throughout the home to add interest and break up some of the huge expanses of walls. The kitchen, which is open to informal eat-in space in addition to the formal dining/living room, features top-of-the-line appliances such as Wolfe and Sub-zero. It includes a butler’s pantry, a large walk-in pantry, two refrigerators, and two parallel islands, one topped with granite and the other with a solid slab of hardwood. Jane delights in cooking in her kitchen, but one of her favorite features – the huge granite sink -- is the result of a mistake. Power screens protect the lanai from rain and insects. The pristine, heated pool includes a spa and waterfall feature. The home is surrounded by mature trees and grassy areas; a stone walkway circles the waterfront. Since the area is fenced, it is dog friendly. A 24-foot dock offers boat access. And everywhere there are breathtaking water views. All That Grandeur, Yet Truly a Family Home. The home is undeniably grand, from its dramatic foyer and formal, two-story dining/living room to its opulent master bath. Yet this open concept, light-filled space is also a comfortable family home. Family gatherings at Christmas are among Jane’s fondest memories. Jane’s father has lived part-time in the house, which has two bedrooms on the main floor: the master suite and a guest bedroom suite. “My dad lived with us for several months a year,” Jane notes. “Since he is older, we wanted a bedroom that is easily accessible. It is also perfect for a nursery or child’s room.” The other bedrooms are on the second level. The two garages, designed by Peter, have also served as family get-together space. The extra deep garages — a 2-car for Jane and 3-car for Peter -- are finished with tiling, custom built-ins, a sink, real wood doors, and refrigerators. Peter’s garage has heat and air conditioning. Peter also designed the large, circular driveway. “He did not want to have to back up to get out,” Jane points out. The Amenities of Queen’s Harbor. 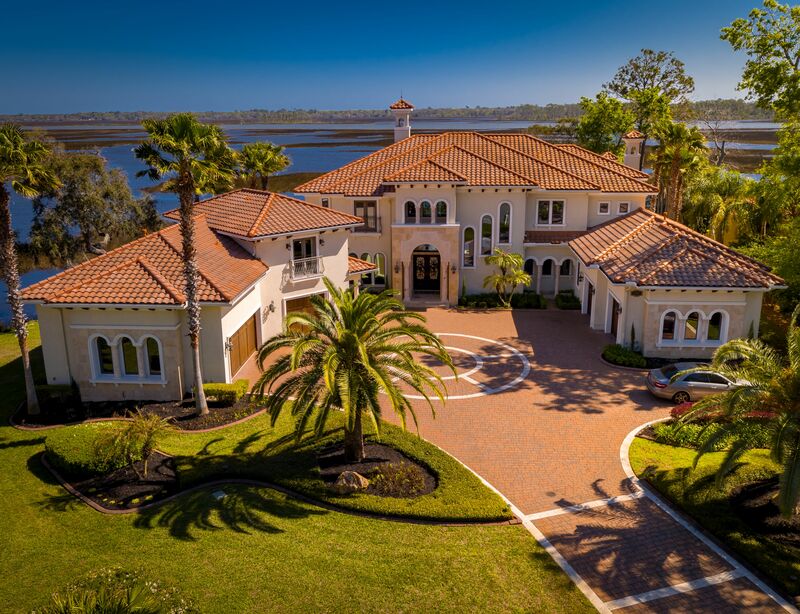 The exclusive Queen’s Harbor community, located about 5 miles from both the beach and the Mayo Clinic, offers a broad array of resort-style amenities, from a golf course, fitness center and tennis courts to a marina, a pool, and a clubhouse. Jane notes that all of the neighborhood’s streets have sidewalks, making it easy for her to walk her dogs. Although their home offers aging-friendly, main level living, Peter and Jane have decided to downsize now that their children have left home. But Jane admits that it won’t be an easy change. * The homeowners’ names have been changed to protect their privacy. For more information, call us today @ 904-570-1216.